RockUnitedReviews: SAVATAGE: Return To Wacken"
Celebrating the return to the stage of one of the world's greatest progressive metal bands? That's the slogan from a band that we dismissed in 2002, but have come back with this very release and the 2015 summer appearance at the Wacken festival. 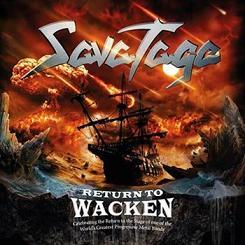 Return To Wacken is however not the live release, featuring studio versions of Savatage's greatest hits and classics including Jon Oliva's personal memories of Wacken Open Air 1998 and 2002. That's a bit strange? But it's a nice compilation and according to the booklet, Jon Oliva thinks of Wacken as and I quote, "something that can only be experienced, there is a feeling you get there that that I am not sure you will feel anywhere else in the world." Track listing, based on their two previously performances at Wacken, there's absolutely nothing to complain about as they are all classics. Hall Of The Mountain King and Prelude (from the album Hall Of The Mountain King). Gutter King and When The Crowds Are Gone (from the album Gutter King). Believe and Tonight He Grins Again (Streets A Rock Opera). Chance (Handful Of Rain). Edge of Thorns (Edge Of Thorns). The Wake of Magellan and The Hourglass (The Wake Of Magellan). Dead Winter Dead (Dead Winter Dead). Eleven tracks of pure class and the booklet include all of the lyric and the two page Wacken write-up by Jon Oliva. To start going through all of the tracks is a waste of time and space as every one (perhaps with the exception of Dead Winter Dead) is absolutely killer. It's up to you to decide if you need the comp. But one thing's for sure, this is the perfect start to the level one beginner about to play Savatage for the very first time. "Another sleepless night. A concrete paradise. Sirens screaming in the heat. Neon cuts the eye as the jester sighs at the world beneath his feet... It's a Gutter Ballet".